If it's the Christmas season, you know there is lots of glitter in the classroom. I just love making crafts with glitter; they're so sparkly. But, my favorite part is the looks on the children's faces. 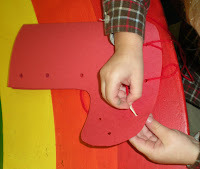 They love to see the final transformation of the project when the glitter is added. Last week, when I forgot my camera, we made the egg carton Christmas tree ornament. This is where you take an egg carton, insert a pipe cleaner through the top, paint it with glue, then sprinkle lots of glitter. This is a big favorite of mine. 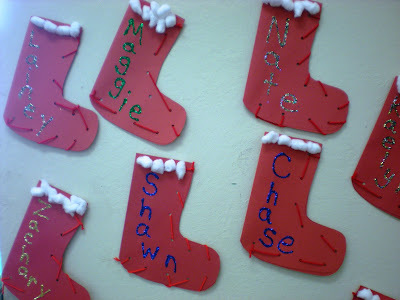 We "sew" the stocking together, add some cotton at the top, then I write the children's names in glue and we add glitter. They LOVE this. Mouths are open in awe at the final product. The sewing can be a bit tedious, but they get through it. I don't have any more glitter activities in the works. Maybe I can think of something:). Love these. May have to try them tomorrow. I love glitter too! Glitter is always fun for crafts. What is not so fun is when one child decides to dump it in another child's hair. The stockings do look great. 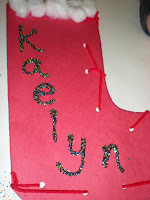 I loved the pics of how the kids are adding glitter and trying to sew the sweet Christmas stockings. It sounds like so much fun! The other day my niece and two of her friends came over after school and after a bit complained of being bored. I suggested they go over to my studio and drag out the art box. What did they pick - the chose the glitter. Needless to say, I now have glitter all over my desk, in the drawers, on my chairs, in the drawers,and across the floor. I don't think it is possible to get all that glitter to every go away:) But I am the "cool" aunt - just because I had the glitter! I enjoyed making these too, when I had my own class. Glitter of course is always a big hit! 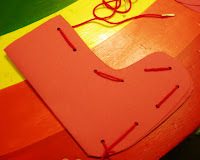 I start earlier in the year with lacing projects so that by Christmas the kids have an "idea" of how to do it, then it's not such a "freak out." 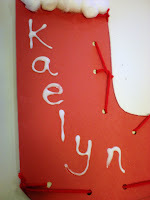 *"lacing letter L's" just cut a large "L" out of poster board, punch holes around edges, tie yarn to "L" and lace. *"Mittens" of course to go along with the Mitten book. * Sewing on burlap...just give each child a not too big, not too small piece and let them "sew" This one is just a lot of fun! Love your blog! I'm just starting out and you are one of my fave's! Thanks for the wonderful share! Oh, they are so cute! 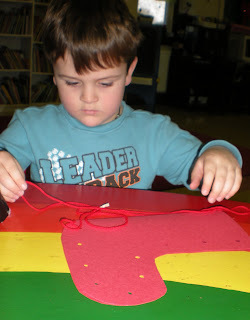 I bet they loved making them and a great fine motor activity thrown in there with the craft. We made glitter snowflakes for the tree. Anything with glitter makes the girls SMILE! The little scraps of paper from the snowflakes drove my hubby a little bonkers. Ha, Ha! Oh this is a neat idea. 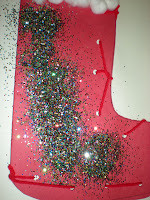 My kids love the glitter projects and go to town with the glitter, I never seem to buy enough. I love those stockings, it is very cute! You are so clever.